Contact us for more information on Tire Sales & Services. Not all tires are the same. Not all drivers are the same. At Frank Motors we will find out what your needs are based on your driving style, vehicle usage, and how long you plan to keep the vehicle. Once we know what you need, we can recommend the best options to fit your budget. Whether you need winter tires, all-seasons, performance tires, or a winter wheel package Frank Motors will help you make an informed choice that feels right on the road and right in your wallet. We can also provide you with options for winter or summer rims. Frank Motors has promoted the use of winter tires since the 1960s. With today's tire technology, winter tires provide exceptional traction on ice and snow and make winter driving much safer and more enjoyable. Winter tires are designed and manufactured to stay soft and flexible even in the extreme winter temperatures that we see in Winnipeg. This allows for more surface contact and better traction during the winter season. Although all-season tires claim to do well in the winter, no tire can perform well in all conditions. And the cost of having summer and winter tires is minimal over the life of the tires and it gives you greater confidence driving in adverse conditions. Let our knowledgeable team at Frank Motors help you choose the best winter tire and rim package to suit your specific driving needs. For many years, race cars, motorcycles, and aircraft having been using nitrogen to fill their tires instead of just air. Nitrogen has larger molecules than regular air, thereby reducing leaks through the tire. Also, nitrogen is drier than air which reduces the risk or leaks caused by rust or corrosion on the tire rim. Frank Motors offers safe and easy storage of your off-season tires. Never again handle heavy and dirty tires or lose valuable space in your home or garage! With our easy-to-use program, Frank Motors clients receive first-in-line status for seasonal tire changes and a complete inspection, cleaning, rebalancing, and treatment of your tires. 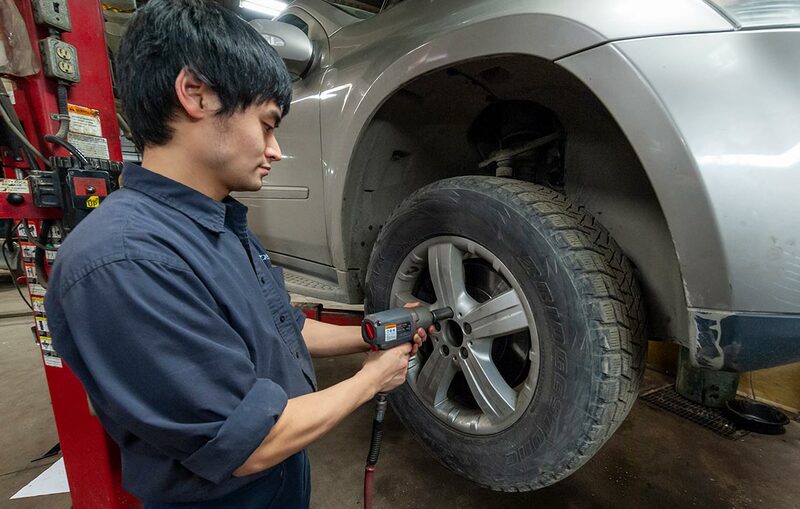 Tires are a critical component of your vehicle, which is why we offer the best in convenience, care, and safety when dealing with your seasonal tires. Proper storage is key to maintaining the integrity of your tires, and helping take your tire storage headaches away!